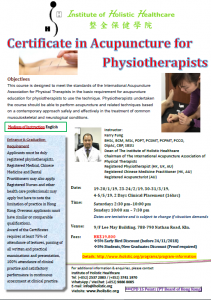 This course is designed to meet the standards of the International Acupuncture Association for Physical Therapists in the basic requirement for acupuncture education for physiotherapists to use the technique. 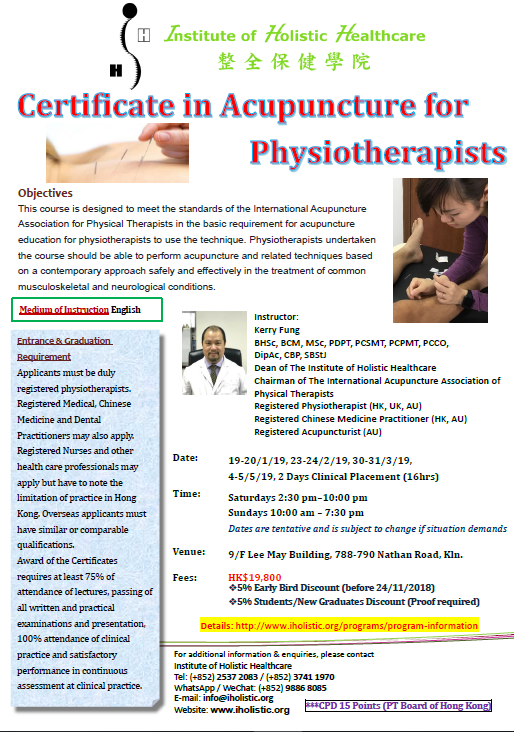 Physiotherapists undertaken the course should be able to perform acupuncture and related techniques based on a contemporary approach safely and effectively in the treatment of common musculoskeletal and neurological conditions. Applicants must be duly registered physiotherapists. Registered Medical, Chinese Medicine and Dental Practitioners may also apply. Registered Nurses and other health care professionals may apply but have to note the limitation of practice in Hong Kong. Overseas applicants must have similar or comparable qualifications. Award of the Certificates requires at least 75% of attendance of lectures, passing of all written and practical examinations and presentation, 100% attendance of clinical practice and satisfactory performance in continuous assessment at clinical practice. Venue: 9/F Lee May Building, 788-790 Nathan Road, Kowloon.